This autumn suncatcher is inspired by nature! The autumn ombre prism crystal decoration is a nice size for the rearview mirror or to hang in a window at home in the kitchen, nursery, living room, sun porch, in the garden or at the office! The wire wrapped crystal beaded suncatcher is handcrafted and uniquely designed with wire wrapped glass beads in ombre colors of fuchsia, smoky grey, topaz and light pink. 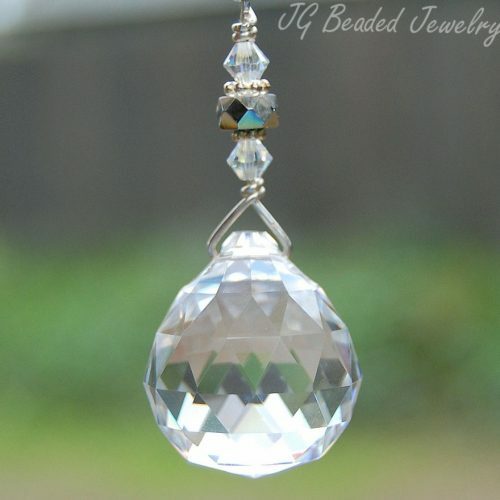 A gorgeous clear faceted 20mm prism crystal hangs from a silver bail and will give off rainbows when in direct sunlight. 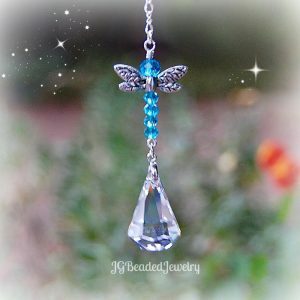 Special requests are welcomed, I am always happy to work on unique designs to fit your wishes – just send a message!